Recent years have seen renewed interest in the potential capacity of transparency to improve democratic governance. Timely, accurate, granular and freely-available information is generally regarded as intrinsically valuable, as well as having many instrumental benefits. In the field of electoral governance, transparency involves openness about the rules and procedures, outcomes, and decisions processes used by electoral authorities. It is widely assumed that this will build public trust, improve policy-making, and facilitate accountability. In practice, however, the instrumental consequences of transparency are less clear-cut than many proponents claim. It remains difficult to establish whether, and under what conditions, greater information alone strengthens the accountability of government bodies to their own citizens, the quality of public services, or the compliance of agencies with international norms and standards. There may also be negative consequences, for example if electoral faults are highlighted without redress. 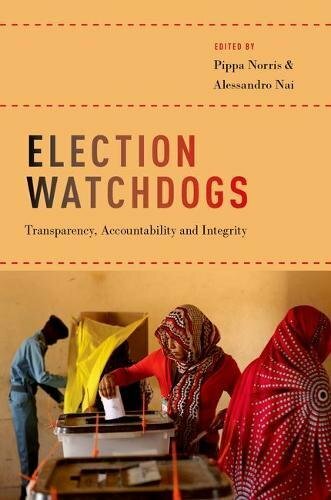 To understand these issues more fully, this book brings together original research which assesses the contemporary drive towards open electoral governance and identifies several conditions predicted to determine the success of transparency in strengthening electoral integrity. To be effective, we argue that transparency ideally needs to be accompanied by accountability (identifying the underlying reasons for any incidents of electoral maladministration and responsibility for any flaws which occur) and also mechanisms ensuring compliance to improve performance (including the use of incentives and sanctions). It is also important to supplement the conventional chain of electoral accountability in democratic states by multiple channels – upwards towards the international community, horizontally among state agencies, and vertically downwards to civil society. These safeguards are designed to strengthen mechanisms of transparency, accountability, and compliance.